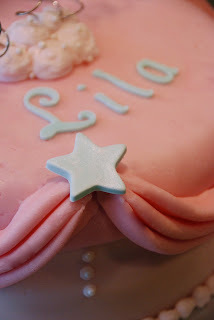 Here are some photos of my first attempt at making fondant swags. 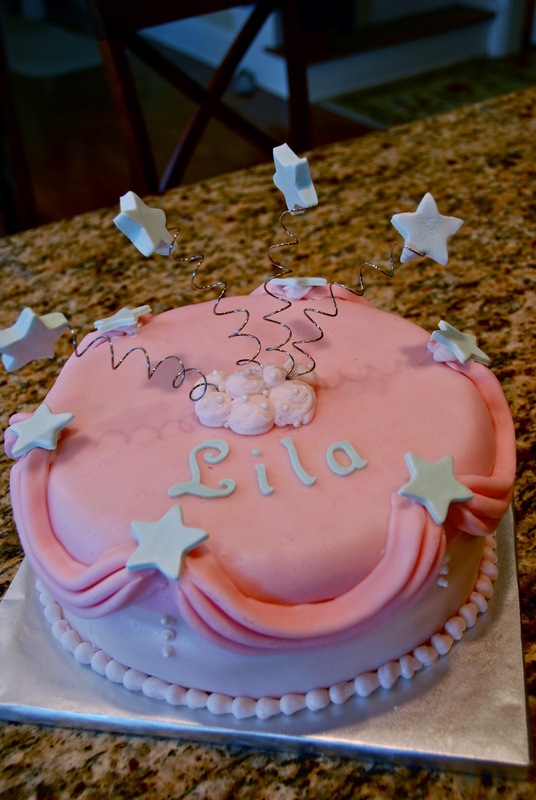 My friend e-mailed me a while back with a photo of a cake that her daughter loved and wanted me to make for her 4th birthday party. It LOOKS impressive, but I was not discouraged at all when I watched the YouTube video about how to accomplish this fairly simple technique. The "cake-tastrophe" happened when I attempted to use some fondant that I had made a couple of weeks ago. It should have been fine, really. I colored it and covered the sides of the cake with it; then I added more color to it to cover the top of the cake, and it worked OK there too. But, it was NOT cooperating AT ALL when I tried to make swags with it. No matter how much I worked it, nuked it, added Crisco to it, it was doing nothing but cracking and tearing apart. Still not sure why. So, I reluctantly made a fresh batch. And, it gave me the exact same problem. Then, since it was nearly 9pm on Friday night (day before the party), I resorted to sending my hubby to Wal-Mart to pick up some pre-made fondant while I took a much-needed break. Fortunately, he had the foresight to pick up SEVERAL different kinds for me to choose from, including some that was pre-colored pink. I was skeptical, but lucky for me, it matched perfectly, and the swags came out much smoother and easier than before. The next challenge came when trying to attach the swags to the cake. 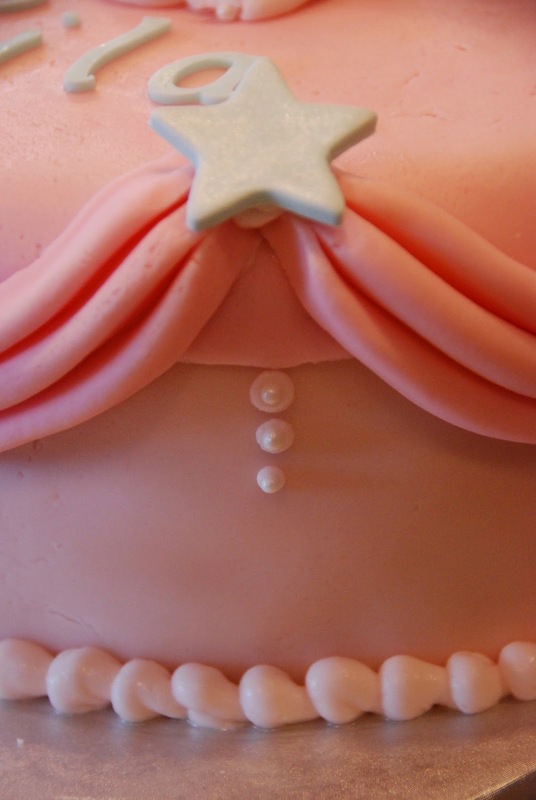 The photo that I was copying showed the swags hanging from the SIDE of the cake, not the top. The swags I had made were too heavy to do that, so I had to move them up. Not sure how they did that without the swags sliding off of the cake. Lastly, I added the star medallions, the bottom border, the shooting stars, and the pearl accents. 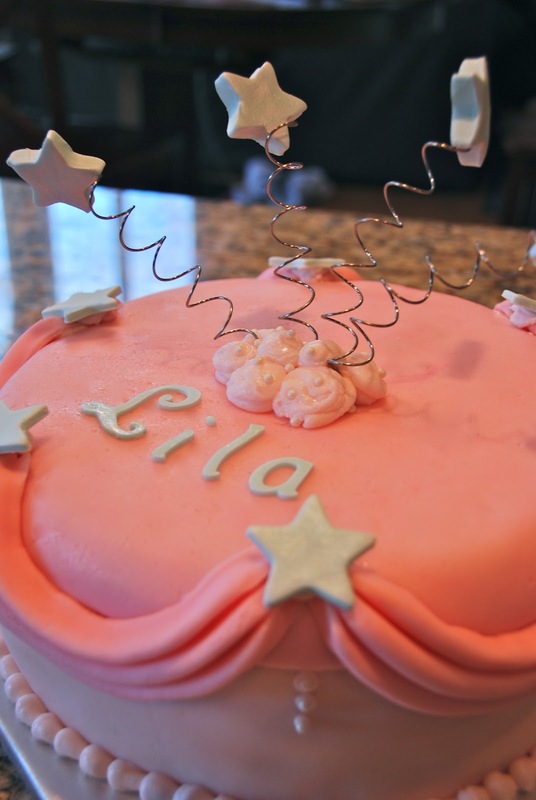 Then, I still had a little time left before the cake was to be picked up, so I got out my Cricut Cake machine and cut Lila's name out of some leftover gumpaste. All in all, it was harder than I thought it would be, but I was pleased with how the cake turned out. I definitely could use some more practice with swags & fondant draping, though. 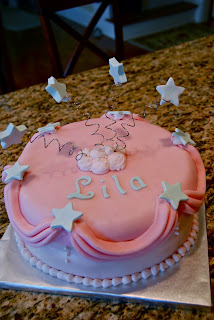 The best part was hearing that when I texted a photo of the cake to Lila's mom, Lila grabbed the phone and ran around showing everyone her cake... I guess that means she loved it! Thank you, Ellen! You can get the wires at stores like Wal-Mart or Michael's or JoAnn's. I'm sure you can find them online as well... try any of your favorite cake supply sites. These particular ones were from the Duff Goldman product line at Wal-Mart. The stars I made were gumpaste.